We're going a little old school with this 2 tone Black & White Mesh cap. 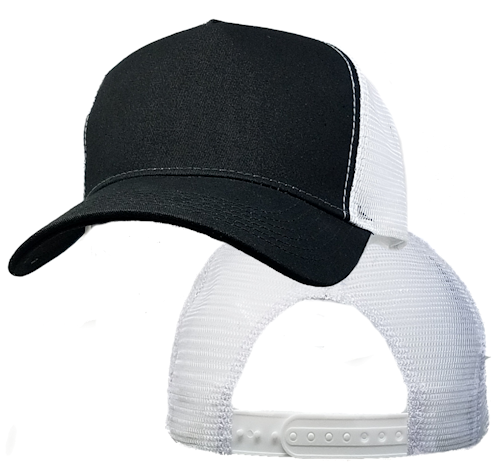 The bill and crown are black with bright white mesh and a snap back adjustable strap. hese are great hats. I have been buying them for many years. These hats wash very well unlike other large hats from other companies. Im glad to see they are offering more color choices in the structures mesh hats, but would like to see even more. The white mesh is very bright, I would rather it be a light grey color but otherwise perfect hats for large heads. As always it’s awesome, had a patch from Man of War Key in the Bahamas sewn on. It’s great. As far as size I wear a 7 7/8 fitted cap. I have all snaps in the back snapped except three. Big beautiful hat!! Love this company! !